It's rare when a game based on an existing property is good, let alone inspired, but that's what two Cartoon Network games I played at E3 2017 promised for me. 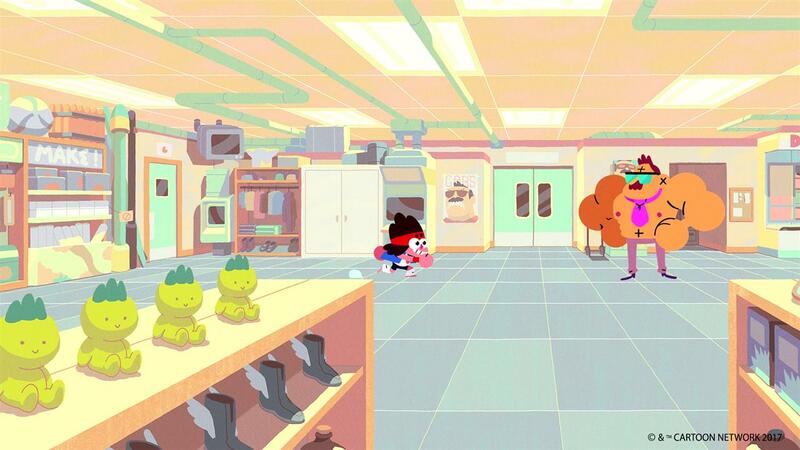 Let's start with OK K.O.! Let's Play Heroes, a game based off a TV show that hasn't even come out yet. A dev at Capybara Games informed me this has provided his team with the unique experience of developing this game side-by-side with the show, working with its creator, Venture Bros. (full disclosure, maybe my favorite show of all time) and Steven Universe veteran, Ian Jones-Quartey. 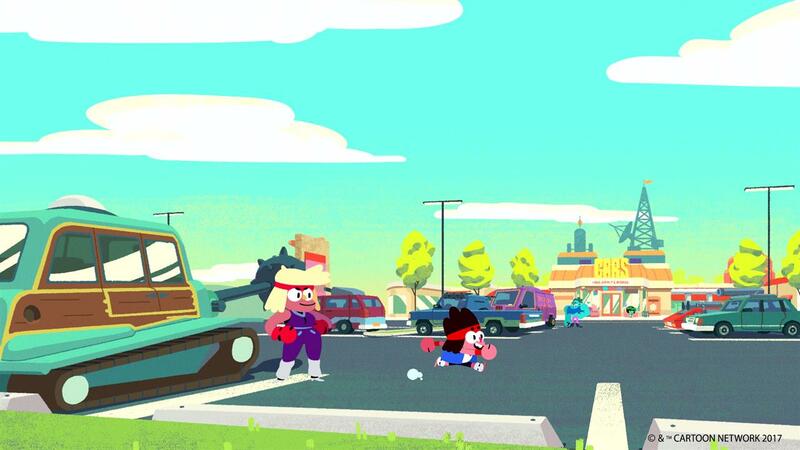 In the game, you play as K.O., an overenthusiastic kid who works at a strip mall and wants to be a great hero in a world full of them. Heroes populate rival stores in the area, and there's a bureaucratic structure to this world of heroes that is playful and bizarre. The level design and camera is based on the kind of shot composition that would make up the would-be cartoon. There's a 360 hub in the vain of a strip mall where our hero, KO, works and hangs out. It adds the feeling of being in the show, supported by the terrific voice talent and animations. The characters are designed from the ground up by the team, who have the showrunners blessing to not bother with restricting assets, and it's noticeable when watching the characters move and contort to fit the situations, whether its being told your precious van was abducted, or being on the receiving end of a killer punch from our hero. The quests are designed to work as mini arcs in an episode of this show, and it's a smart conceit since at the end these quests, you'll get a hero card for the person you helped to use in combat as a sort of summon. The additional gameplay incentive to dive into these stories with these delightful characters is a nice touch. The combat is reminiscent of Viewtiful Joe, and it shows in the colorful animation and punch to each connecting blow. You fight enemies in 2D plains, a few strong ones at a time, using a single attack button and the joystick to change the direction of your blows, along with a dodge and jump move to round out your abilities. The art, sound, color, everything aesthetically is right where I want it to be in the battles, and it feels like a truly kinetic experience. There are also RPG elements like stats and upgrades that also marries itself well to the story/character's obsessions with being the strongest hero. There's even some fun choices you can make in the dialogue options reminiscent of say, Mass Effect, without being pretentious or boring ahem. I can't help but think the success of this demo has to do with the combination of good design, and showrunner blessing and involvement. Meanwhile, Steven Universe: Save the Light is a gorgeous looking the game is gorgeous, Paper Mario meets Chrono Trigger style RPG and playing it made me really excited for Grumpyface's first foray into console gaming. 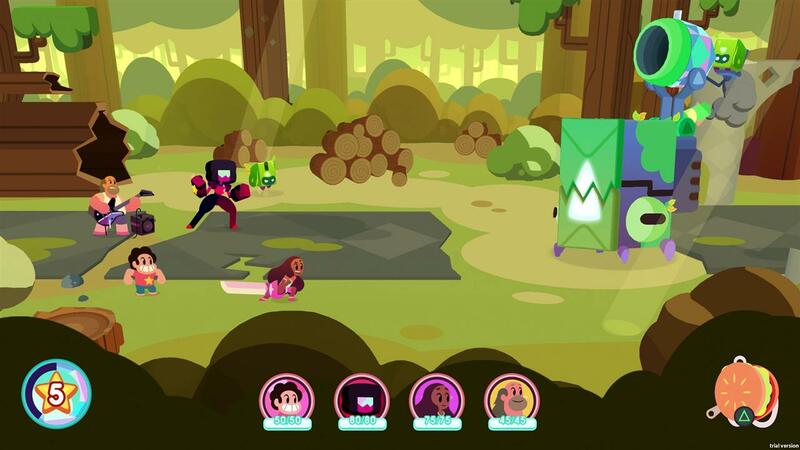 The story involves Steven and the gang off on adventure to face a mysterious force that threatens the Prism from the previous mobile game Steven Universe: Attack the Light. Much like OK K.O. 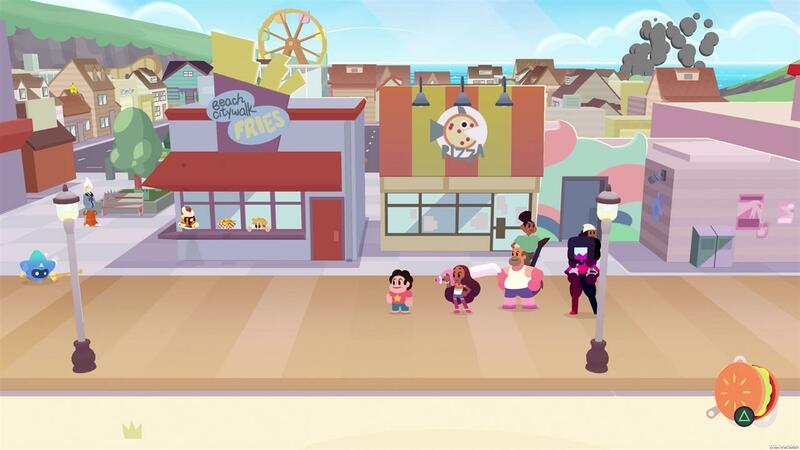 !, this game was developed closely with Rebecca Sugar, which means we have full voice talent of the cast, and writing that feels connected to the characters. The battle system is really fun and really smart, combining the kind of position-based turn-based combat reminiscent of Chrono Trigger or Wild Heart, along with character combinations of the former game, effect stacking, and timed based attacks of the Paper Mario/Mario RPG games. You can position your characters' abilities to assist each one another, building up a relationship meter that allows them to combine and make a new, super character, that lasts a battle. 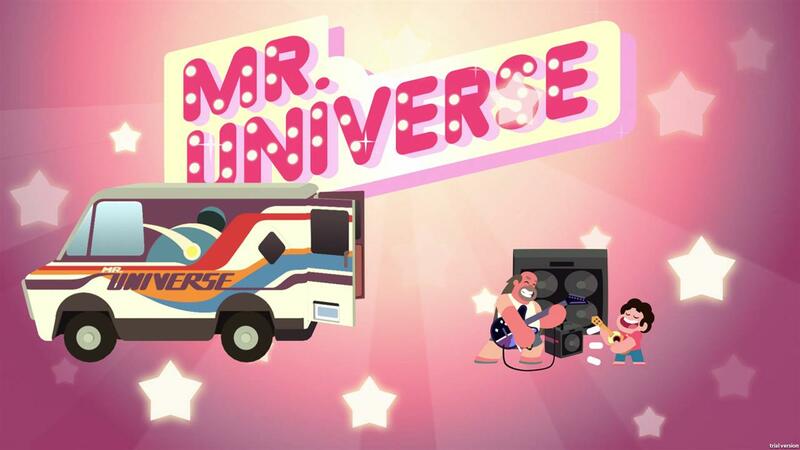 It's a cool mechanic that directly ties into Steven Universe's themes of relationships and connections. There's a shared ability meter in the form of stars that recharges as you play, and figuring out how to maximize the use before it reloads is key to playing effectively. This is an underrated mechanic in RPGs, and really narrows the focus of the battle experience to the essentials, forcing you to make interesting decisions when faced with only certain joint resources available at any time. The character designs are not only gorgeous, but based off models that the show uses. The design of the world is breathtaking, the beachside town is pitch perfectly realized, the light and shadows cartoonishly joyous, dancing off the landmarks you love from the show. Exploring the space is really an unabashed joy, I could barely hide my glee while playing. What got me most excited however was the way the game did RPG exploration. Where you swap out different characters because they perform different functions. 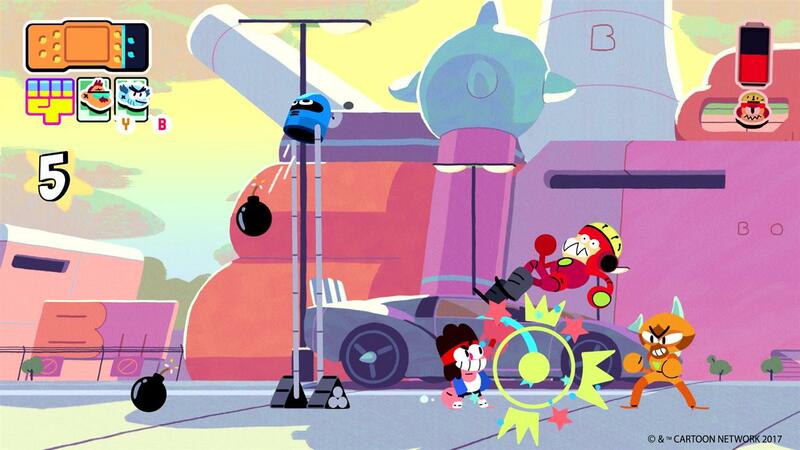 One character has a sword to clear away grass and objects, while Steven's dad has a guitar that helps solve puzzles and more effectively initiate combat, and Steven has a double jump to help with platforming portions. It's worth using each character in an environment just to pick it apart and explore it. It's the kind of mechanic that keeps giving back because you feel in charge of the discoveries you're making. I am completely excited for these games, and they were a blast to play. Here's hoping to more and more titles based on existing properties that look like this.